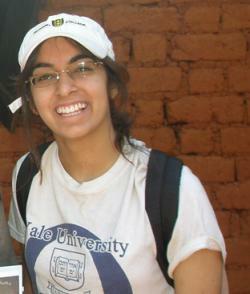 Durga Thakral (PC ’12) loved her four years in Pierson and at Yale. She became very involved in Engineers without Borders, Girls’ Science Investigations, and Elder Horizons. From the jungles of Ecuador to the rural villages of Cameroon to the metropolises in India, Durga enjoyed and is thankful for the many opportunities for research and service that Yale and Pierson College provided. She majored in Molecular Biophysics and Biochemistry and researched in the laboratories of Scott Strobel and Tom Steitz in the combined MS/BS program. Durga is currently a student in the MD/PhD entering class of 2012 and will do her PhD with the NIH Oxford-Cambridge Scholars Program. She is excited to return to Pierson as a graduate affiliate and hopes to be a resource for students interested in service and research opportunities at Yale and beyond.